Illinois Lieutenant Governor Juliana Stratton (right) addresses the audience. Event emcee Carla Curtsinger (left) joined her for the "fireside chat." 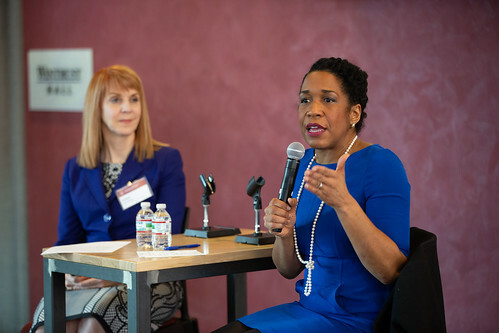 In February 2019, alumni, students, and friends gathered for the first Women's Leadership Forum hosted by the Executive and Professional Education Center. The forum received generous support from Loyola’s Gannon Center for Women and Leadership and Bright Pink.